The Ministry of Health has received US$41,000 worth of advanced health surveillance equipment from the Government and People of the Republic of China. 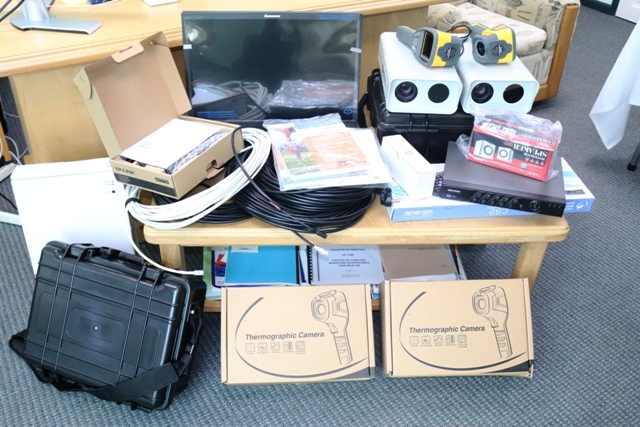 Four handheld Advanced Infrared Scanning Systems and four stationary Advanced Infrared Scanning Systems with built-in state-of-the-art high-resolution tracking cameras, along with other accessories, were handed over to the Ministry of Health on Tuesday by Madam Ou Boqian, the resident Chinese Ambassador to Grenada. “This is a very crucial piece of equipment, as it would allow us to be able to detect anyone coming into the country with possible conditions we do not want” explained Chief Medical Officer, Dr George Mitchell, who heads the country’s national response and chairs the Ministry’s Infectious Diseases Taskforce, which was constituted by former Health Minister Dr Clarice Modeste-Curwen in 2014. Health Minister Nickolas Steele receives items from Madam Ou Boqian, resident Chinese Ambassador to Grenada. Health Minister Nickolas Steele received the items on behalf of the Grenadian people, and thanked the Chinese Ambassador, and by extension her Government and People for their assistance. The Health Minister reassured the Ambassador that the Ministry will not only care for the equipment, but also put it to use for the benefit of the all citizens of the tri-island. The equipment will be installed at the main ports of entry in the coming weeks, as local health authorities continue to beef-up surveillance and response systems to combat infectious diseases. The Ministry now has 13 handheld Advanced Infrared Scanning Systems and 2 stationary Advance Infrared Scanning Systems with a built-in state-of-the-art high-resolution tracking cameras.